Set in an alternate history Chicago, season two of Two Guys, a Girl, and a Goblin is a twice monthly podcast of an ongoing campaign of Dungeons and Dragons, featuring Sammy Kampersal as Ivana Diq-Tiqle, a Human Rogue / Binder, Aaron Buell as Toots P.I., a Gnome Wizard, Eric Helmken as Chuck Law, a human Fighter / Cleric, and Jim Kliss as The Dungeon Master and Splyg, a Goblin shaped Warforged Artificer. Join us every other week for another exciting episode where our players will trek off in search of fun, adventure, and most importantly, loot! Jim Kliss as The Dungeon Master and Splyg, a Goblin shaped Warforged Artificer. 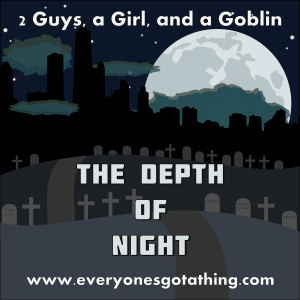 Posted in 2 Guys a Girl and a Goblin, 2 Guys a Girl and a Goblin, Episodes, Episodes, Podcasts	| Tagged 2GAGAAG, 5th Edition, Actual Play, Comedy, d&d, dnd, DND 5E, dungeons and dragons, Dungeons and Dragons 5th Edition, Goblin, Pathfinder, podcast, RPG, Tabletop Gaming	| Comments Off on S3E19 – The Lost Mines of Phandelver Pt 19: Are You Trying to Kill Yourself with Meat? Posted in 2 Guys a Girl and a Goblin, 2 Guys a Girl and a Goblin, Episodes, Episodes, Podcasts	| Tagged 2GAGAAG, 5th Edition, Actual Play, Comedy, d&d, dnd, DND 5E, dungeons and dragons, Dungeons and Dragons 5th Edition, Goblin, Pathfinder, podcast, RPG, Tabletop Gaming	| Comments Off on S3E18 – The Lost Mines of Phandelver Pt 18: I Didn’t Realize this Beer was 8.5 Percent Alcohol. Dungeons and Dragons is property of Wizards of the Coast, a division of Hasbro, Inc.